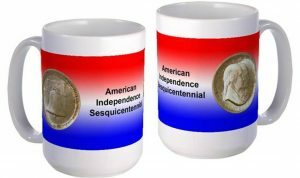 Today, the Sesquicentennial of American Independence Commemorative Silver Half Dollar Coin remembers when Patrick Henry gathered men and began the march to regain the stolen gun powder on May 2, 1775. Two nineteenth century history resources provide different descriptions of that fateful march. Two days after the affair at Lexington, Lord Dunmore, governor of Virginia, sent a company of marines, who, in the night, entered the capital, Williamsburg, and carried off from the public arsenal about twenty barrels of powder, and conveyed them on board an armed schooner lying in James river. When the inhabitants learned the fact the next morning, they were greatly exasperated. Numbers flew to arms with the intention of recovering the powder. By the persuasions of the leading citizens, and of the council, they were restrained from acts of violence. The Council, however, addressed a remonstrance to the governor, who promised, verbally, to restore the powder when it should be needed. The people deemed his answer unsatisfactory. When intelligence came of the conflict at Concord, it flashed upon their minds that the seizure of the powder and munitions of war in the colonies was concerted by the royal governors, in accordance with instructions from the ministry. Patrick Henry invited the independent companies of the county of Hanover to meet him at a certain place on the second of May. They, seven hundred strong, obeyed the call. He made known why they were called together; spoke of the fight at Concord, and the occasion of it. Then, at their head, he marched towards Williamsburg, determined either to have the powder returned, or its value in money. On their way a messenger from the frightened governor met them, and tendered the money for the full value of the powder. The money was afterward sent to Congress. The companies now disbanded, with the understanding that when called upon, they were to be ready to march at a minute’s warning. Thus did Virginia emulate Massachusetts. Virginia was still angry at the seizure of its provincial magazine and at the menace of Dunmore to encourage an insurrection of slaves, when on the second day of May, at the cry from Lexington, the independent company of Hanover and its county committee were called together by Patrick Henry. The soldiers, most of them young men, kindled at his words, elected him their chief, and marched for Williamsburg. On the way it was thought that his army increased to five thousand. Alarmed by the “insurrections,” he convened the council of Virginia, and in a proclamation of the third of May did not scruple to utter the falsehood that he had removed the ammunition lest it should be seized by insurgent slaves. Message after message could not arrest the march or change the purpose of Henry. Lady Dunmore, who need have feared nothing for herself, professed to dread being retained as a hostage, and with her family retired to the Fowey man-of-war. The governor first resolved to resist and then thought it best to yield. On the morning of the fourth, at about sunrise, a messenger met Patrick Henry at Doncastle’s Ordinary in New Kent, and as a compensation for the gun powder taken out of the magazine, paid him three hundred and thirty pounds, for which he was to account to the provincial congress of Virginia. When it was afterwards found that the sum exceeded the value of the powder, the next Virginia convention directed the excess to be restored. On the other hand, the interior resounded with the praise of the insurgents. On the eighth, Louisa county sent them its hearty thanks. On the ninth, Spottsylvania cordially approved their prudent, firm, and spirited conduct; and Orange county in a letter signed among others by the young and studious James Madison, a recent graduate of Princeton college, applauded their zeal for the honor and interest of the country. On the eleventh, Patrick Henry set off for the continental congress; and his progress was a triumph. 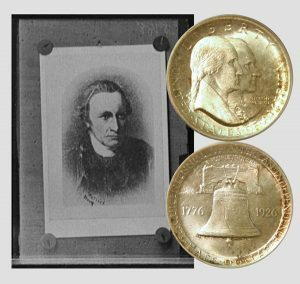 The Sesquicentennial of American Independence Commemorative Silver Half Dollar Coin shows with an artist’s image of Patrick Henry.